If you've been struggling to create the sales copy you need to succeed in todays competitive Internet marketplace, this is definitely the most important letter you will read today! Im about to reveal how you, or anyone else for that matter, can instantly generate high quality sales letters that will drive people to take action and buy your product or service even if you cant write, cant type and struggled to pass high school English! Its true, if you have ever wished that you could magically produce sales copy that will produce sales like crazy without having to spend hours at your desk slaving over every word or without having to pay way too much of your profits to professional writers, then I urge you to keep reading this letter. Heres Your Chance to Finally Get the Laser-Targeted, High-Quality Sales Copy You Need to Grow Your Business & Explode Your Profits! Heres why: In just a few moments Im going to reveal how you can begin producing your own highly effective sales copy with a few clicks of your mouse! 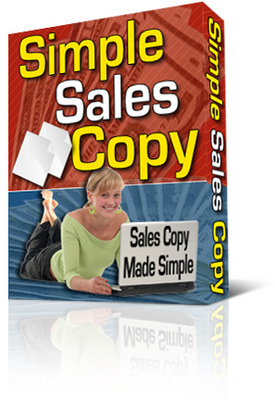 With this amazing tool, you can now generate all the top-notch sales copy you need to succeed online quickly and easily! Thats right, you can now get well-written sales copy without giving yourself a headache or spending all your profits on writers fees. This amazing program allows you to create captivating sales copy in just a few clicks of your mouse you simply select the letter components you want to use and enter some basic information and the software program does the rest instantly creating order-pulling, cash-producing sales copy you can start using immediately! Stop wasting your valuable time writing your own sales copy or your valuable money on professional writers! No longer will you have to worry about how youre going to pay a writer to produce sales copy for you! Remember in todays competitive Internet marketplace, you need every advantage you can get and the Simple Sales Copy software program is a great way to ensure you dont spend too much time writing and too little time on other important parts of your business. Certainly, in todays competitive marketplace, even $200 would not be unreasonable but relax you wont have to pay near that much for the Simple Sales Copy software program.